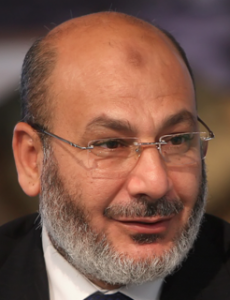 Safwat Hegazi was arrested early Wednesday morning Security forces announced early Wednesday the arrest of Islamist preacher Safwat Hegazy near Marsa Matruh. Hegazy disappeared following the dispersal of the Rabaa Al-Adaweya sit-in in Cairo a week ago. The sit-in, set up by supporters of ousted president Mohamed Morsi on 28 June, harboured Hegazy for over a month and thus prevented security forces from arresting him despite outstanding warrants for his arrest. Hegazy was arrested at the north-western Siwa-Matruh road, kilometre 39, said a source within the Ministry of Interior who preferred to remain anonymous. He added that Hegazy was attempting to flee the country, headed to Libya. The preacher shaved off his white beard and replaced it with a dark, dyed goatee as a form of disguise. Security forces refrained from announcing Hegazy’s current location for ‘security concerns’. They also announced stopping Mourad Ali, Freedom and Justice Party (FJP) media advisor, at the Cairo International Airport and preventing him from flying to Italy. Ali’s name was on the airport’s travel-ban list according to a decision by the Prosecutor General, the Ministry of Interior source said. He was referred to investigation following his arrest. The movement stated that Hegazy, who they accused of inciting violence, should have been at the forefront of the battle, and not a fugitive in disguise. Hegazy was a member of the National Council for Human Rights (NCHR), appointed by the now dissolved Shura Council in September 2012. His appointment stirred controversy, and following Morsi’s ouster, the criticism against Hegazy’s membership in the council mounted amid controversial statements he released. Interim president Adly Mansour ratified on 6 August a cabinet bill which ordered the restructuring of the council. Safwat Hegazy (aka Hegazi, Hejazi) is usually described as a cleric and his CV says he grew up in a devout Muslim family with connections to Al-Azhar. His involvement with the “Islamic Awakening” began during the time of the 1978 Iranian Revolution when he was 15 years old and attending high school. Following graduation, he moved to Alexandria where he in 1984, he received a degree in Urban Planning following which he relocated again to Cairo. At some point, he says he received a Doctor’s degree in comparative religion from the University of Dijon, France and from 1990-1998 worked as a Professor of Hadith in Medina, Saudi Arabia. Hegazy has held numerous positions in Egypt including as Chairman of the Board of Trustees of the Egyptian revolution which coordinated with The International Committee to End the Siege on Gaza, an organization known to have played an important role in the June 2010 Gaza Flotilla. He is also a member of the Islamic Legitimate Body for Rights and Reform (ILBRR), a religious group established after the 2011 revolution to help coordinate efforts among Egypt’s rising religious political forces and accused by Salafis of falling under the Muslim Brotherhood’s influence. Dr. Hegazy’s CV also says he is the Imam at the Dawa al-Haq mosque in Cairo, General secretary of the Dar al-Ansar Islamic Association, and is employed by the Egyptian Ministry of Awqaf. Hijazi was investigated in Egypt in 2006 for issuing a fatwa calling for the death of visiting Israeli officials and has had legal action brought against him for insulting women who do not wear the “niqab” (full face cover for women), describing them as “whores.” In 2009, he was banned from the UK and described as a television preacher considered to be engaging in unacceptable behaviour by glorifying terrorist violence.” In 2012, he was one of four preachers banned from attending a French Muslim Brotherhood conference on the grounds they “call for hate and violence … and, in the current context, present a strong risk of upsetting public order”. In May 2012, Dr. Hegazy was featured at a launch ceremony for the presidential campaign of Mohamed Morsi where he declared “The capital of the Caliphate – the capital of the United States of the Arabs – will be Jerusalem, Allah willing.” In August 2012, Dr. Hegazy announced on Egyptian TV “One of the tenets of the Muslim Brotherhood, which they cannot renounce, is the Islamic Caliphate and the ruling of the world. Yes. The day will come when we will be the masters of the world.” In December 2012, he he threatened in a speech to “splash Christians with blood” if they tried to join in attempts to bring Mr Morsi down. On July 7, 2013 Dr. Hegazy was one of four individuals described by Egyptian prosecutors as senior leaders of the Muslim Brotherhood and ordered detained on charges of inciting violence which resulted in the killing of anti-Morsi protesters outside the group’s headquarters in Cairo. Dr. Hegazy is a member of the International Union of Muslim Scholars (IUMS) headed by Global Muslim Brotherhood leader Youssef Qaradawi, a virulent anti-Semite, and Dr. Hejazy’s own anti-Semitism was extensively covered in a post from July as part of a series on the visit of an IUMS member and associate of Qaradawi’s to the US White House.